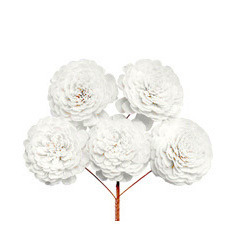 Being a prominent firm, we are engaged in offering an all-encompassing assortment of Shola White Flowers. Considering diverse requirements of our valuable clients, we avail the offered range in various packaging options. To make a defect-free delivery from our end, our quality controllers thoroughly examine the entire range against various parameters. Our offered range is widely appreciated in the market for featuring variegated attributes like aesthetic appearance and premium quality. Located at Kharagpur Near Kolkata, (West Bengal, India), we, “The Floral Factory”, are a well-known manufacturer, Exporter, Trader and supplier of a qualitative range of Dry Flowers Bulk, Potpourri Botanicals Bulk, Shola Flowers, Packed Trays, Potpourri, Floral Exotica, Bouquets & Arrangements, Flower Wreaths, Flower Bunches, Heart Shape Flower Bouquet , Hand Bouquets, Brunch Balls, Ting Ting Dried Flowers, Hand Made Flowers, Exotic Balls, Individual Crafts, Sparkling Glitters, Metallic Abrasives, Fashionable Jute Bag etc. The offered products are processed using advanced technology and latest machine & equipment in accordance with international quality standards. Also, the offered products are extremely valued by the esteemed clients for their perfect finish, attractive design, superior quality, easy to clean, low maintenance and light weight. Apart from this, the offered products are available in various designs, sizes and colors as per the requirements of our clients.